Photo courtesy of Jackson Spalding An artists rendering of what the outside of the College Football Hall of Fame (CFHOF) will look like in Atlanta on Marietta St. when completed. The ground breaking is set for Jan. 28 and construction is expected to be completed in fall 2014. After the decision in 2009 by National Football Foundation to move the College Football Hall of Fame from the 17-year-old facility in South Bend, Ind., to a new facility in Atlanta, the groundbreaking for the Hall has been set for Jan. 28 with a public opening projected for the fall of 2014. The Hall of Fame will be built on what is currently the “Green Parking Lot” of the Georgia World Congress Center on Marietta Street. 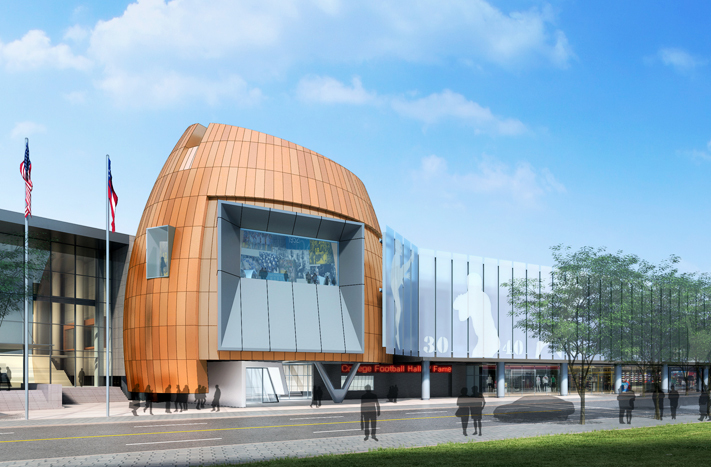 This puts the new Hall of Fame within walking distance of Tech, steps from Centennial Olympic Park and in close proximity of The World of Coca-Cola and the Georgia Aquarium, allowing it to become a local fan-focused attraction, as well as an event facility. At 94,256 square feet, the Hall of Fame will feature roughly 30,000 square feet of exhibit space, as well as a 45-yard indoor football field that also will serve as a unique, flexible programming and event space. According to studies by Atlanta Hall Management (AHM), the museum is expected to attract around 500,000 visitors per year. The South Bend hall was projected to attract 200,000 visitors when it moved from Ohio in 1995, and only drew about 115,000 in its first year, with attendance still decreasing to about 60,000 every year after that. Being near tourist attractions in the city and the expanding tourism market, the National Football Foundation is confident in the number of visitors this new attraction will bring in. The Hall of Fame’s proposed budget of $66.5 million will allow it to break even with attendance of 380,000 to 390,000. According to John Stephenson, President & CEO of AHM, the organization established to build and operate the Hall of Fame in Atlanta, AHM has already raised more than $52 million in active equity sponsorship, mostly from private corporate sponsorships. The almost $15 million gap will be raised during the construction period from other private sources. Once the College Football Hall of Fame is open, the facility will be completely self-supporting, operating on its own revenue generated by a mixture of ticket sales, retail and events, with a projected $11.8 million in taxable sales annually. It will also have an economic impact of $12.7 million for Georgia, also generating more than $1.7 million in sales taxes to the city, county, and state annually, according to AHM and the National Football Foundation. “Atlanta is the heart of college football and we are continuous to and close to many of the great things that happen with college football,” said Gov. Nathan Deal.